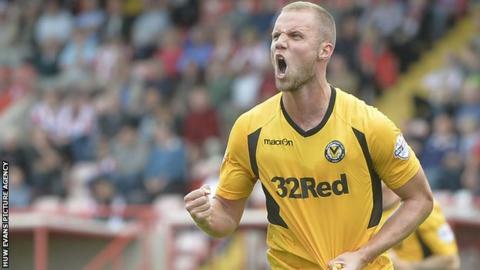 Newport County moved into the League Two play-off places with victory over Hartlepool United. Defender Harry Worley headed home a Robbie Wilmot cross to give the home side a 1-0 lead at half-time. Striker Conor Washington made sure of the win with his seventh goal of the season from close range midway through the second half. Pools' best chances fell to forward James Poole but both his strikes were saved by County keeper Lenny Pidgeley. "We knew it was going to be tough. It was our third game in six days and the players deserve a huge amount of credit. "Their work-rate and the way they played the game, pressing and dispossessing Hartlepool, was a real pleasure to see. "They started the second half better than us, we'd lost our discipline in the shape of our team, and the second goal was crucial for us. It settled us down. "We looked comfortable from thereon in." Match ends, Newport County 2, Hartlepool United 0. Second Half ends, Newport County 2, Hartlepool United 0. Andy Monkhouse (Hartlepool United) hits the left post with a right footed shot from outside the box. Attempt saved. Matthew Dolan (Hartlepool United) left footed shot from outside the box is saved in the centre of the goal. Adam Chapman (Newport County) wins a free kick in the defensive half. Foul by Antony Sweeney (Hartlepool United). Substitution, Hartlepool United. Brad Walker replaces Simon Walton. Corner, Hartlepool United. Conceded by Tom Naylor. Corner, Hartlepool United. Conceded by Adedeji Oshilaja. Substitution, Hartlepool United. Antony Sweeney replaces Jack Compton. Substitution, Newport County. Billy Jones replaces Ryan Jackson. Substitution, Hartlepool United. Jonathan Franks replaces Luke James. Attempt missed. Adam Chapman (Newport County) right footed shot from outside the box misses to the right. Matthew Dolan (Hartlepool United) wins a free kick in the defensive half. Substitution, Newport County. Michael Flynn replaces Christian Jolley. Goal! Newport County 2, Hartlepool United 0. Conor Washington (Newport County) left footed shot from the centre of the box to the bottom right corner. Assisted by Christian Jolley with a cross. Corner, Hartlepool United. Conceded by Leonard Pidgeley. Attempt saved. James Poole (Hartlepool United) left footed shot from outside the box is saved in the bottom left corner. Jack Compton (Hartlepool United) wins a free kick on the right wing. Simon Walton (Hartlepool United) wins a free kick in the attacking half. Attempt saved. Luke James (Hartlepool United) header from the centre of the box is saved in the centre of the goal. Attempt blocked. James Poole (Hartlepool United) right footed shot from outside the box is blocked. Foul by Harry Worley (Newport County). Adedeji Oshilaja (Newport County) wins a free kick in the attacking half. Foul by Luke James (Hartlepool United). Second Half begins Newport County 1, Hartlepool United 0. First Half ends, Newport County 1, Hartlepool United 0. Andy Monkhouse (Hartlepool United) wins a free kick in the attacking half.